Your home is a place of comfort and rest. So imagine this scenario… you come home one day and instantly you know something is not right. You smell a faint foul stench. You feel like a bloodhound going around the house sniffing to pinpoint the source of the smell. As you walk down the hallway and open the door to your bedroom, BAAAMMM!! !, you get smacked with the smell of death. After another minute of detective work you realize the unbearable stench is coming from the supply vent next to your bed. Oh great…. now what? The dead rodent got into the ductwork somehow. Where is the breach? What type of ductwork do you have (flex or sheet metal)? 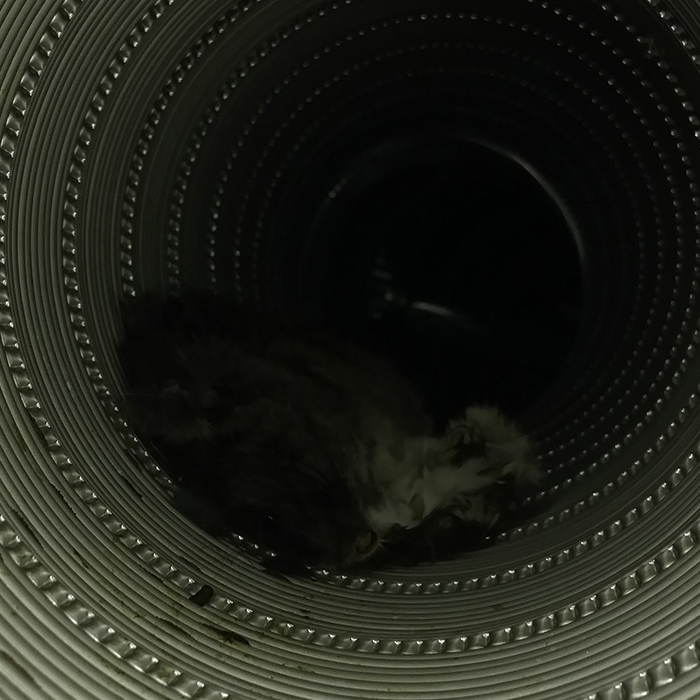 Flex ductwork can easily be torn through by a rodent, especially a rodent that is eager to make your ductwork its home. When the interior of flex ductwork tears it leaves exposed insulation (fiberglass hazard) that can be passed through your duct system into your living space. Sheet metal ductwork won’t be penetrated by a rodent, but most likely there is a break in the connection of one of the duct lines. Rodents will make nests from insulation inside your ductwork. Once a rodent is inside one vent line, they have free access to your entire duct system contaminating it along the way. Rodent urine and feces are now littered throughout the entire duct system. You never know what types of bacteria/diseases rodents are carrying. It smells bad, and you don’t want to leave your family exposed to breathing in this contaminated air. FreshX can solve the problem using video inspection to see the amount of rodent activity and the integrity of the ductwork. We also go into crawlspaces/attics and inspect the ductwork to look for breaches in the connections and will make minor repairs where possible. FreshX will remove the dead rodent, feces, nests, and other particulates from your duct system with our arsenal of cleaning equipment to get you back on track for clean and healthy indoor air. We perform the cleaning of the ductwork under negative air with 5,000 CFM (cubic feet per minute) in conjuction with our powerful air whip system and/or our mechanical brushes.